Dimitri Arvanitis is of Greek-German descent and was trained at the Royal Academy of Fine Arts Antwerp (Class of 2013). The brand started in 2015 as a series of small collections where the designs focus on the visual realization of the final products through creative collaborations (as in this one with Kira and Gary). The menswear collection of 7 looks is the 2nd one by the brand. The collection is a reflection of growing up in between two cultures and their relation to each other nowadays. What started as a quite naive research that was focussed on fashion and visuals of the early 00s and Berlin being the ultimate place to be, it gained deeper meaning and made much more sense after my residence in Athens, where the financial crisis and the arrival of refugees seem more present than in any other country. I adopted prints and elements (fist and flash, Berlin flag) from a label called Industrie 77. back in its day, which seem to fit present protests around the globe. 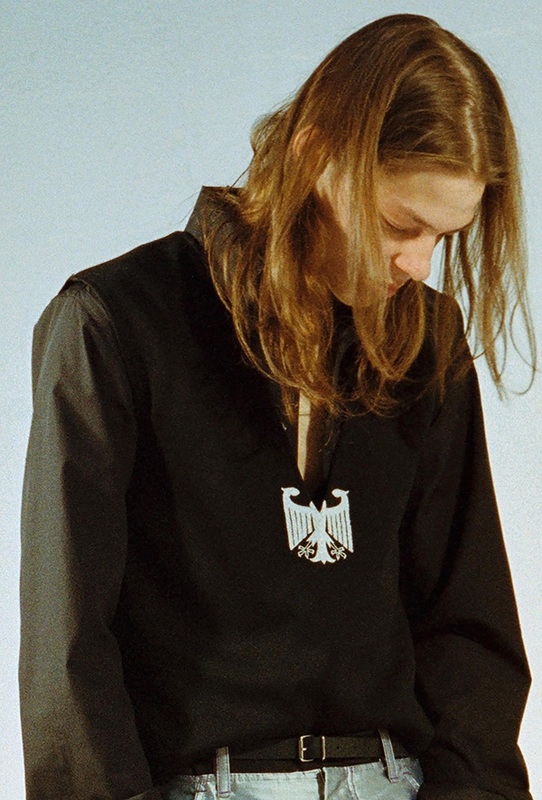 The embroidered German eagle emblem on the other hand is headless because of the deep V-necks and leaves its political orientation - whether it is looking to the left or right - open. The materials variate from very heavily bleached and airbrushed raw denims, sprayed leather, polyester satins to nylons (which were specifically used for the Tru-Spec inspired garments, a leading American supplier for safety equipment). Aesthetically it always has been important and more interesting to me to refer to tacky things which people associate with bad taste and putting them in a new modern context. Working on a low budget, most of the fabrics were left-overs reworked with paint and treatment to achieve the desired look and the illusion that those garments have been kept in a suitcase for years and have been found only recently: 7 looks, each one representing another day of the week.